"I came home on my lunch break from college to find that my one-year-old Valley Bulldog Diesel had made a very, very big mess. Since I had blocked the living room off he hadn't really gotten into much lately. Anyways, I had just gotten this foldout-type mattress. I figured I would let Diesel have it through the day to lie on while I was gone in classes. 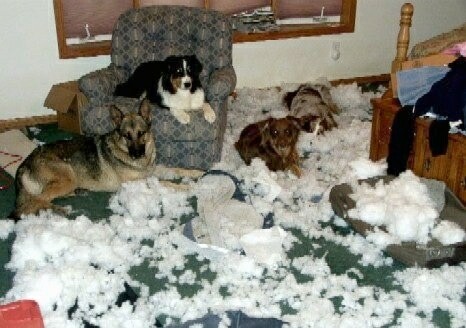 The stuffing was everywhere!" "Diesel knew that he did wrong. All I had to do was look at him and he crouched down, put his ears back and wiggled his stub." "As I was cleaning up the mess he went and hid under the table." "This is a picture of our 1-year-old Olde English Bulldogge that, while in her crate and pen, pulled stuff that was sitting on top of her crate into her pen! Needless to say, she decided to "play" with it and tore up everything including books, a t-shirt, thread and whole lotta other stuff." "This is Monty, our Rat Terrier/Chihuahua mix (Rat-Cha) we rescued from the pound. He was around 8 months old when we took this picture. What we find amusing is that he was looking at us like "Who me? But I didn't do anything...." He always tries to look as innocent as possible. The evidence was all around him, though. 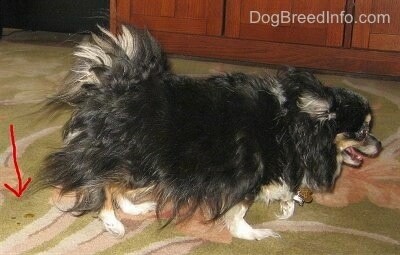 :)"
"My cute little Havanese / Bichon mix (Havachon) Iggy got into a pillow from our couch and ripped up the stuffing. The funny thing is, somehow he managed to unzip the pillow! I re-stuffed it and all was well." Scooter the Jug (Jack Russell / Pug mix breed dog)—"Bad Scooter, Bad Scooter!" "From left to right: Gunner, German Shepherd 10 years; Budweiser, Greater Swiss Mountain dog, 7 years; Bruno, German Shepherd / Aussie 3 years; Kelly, Australian Shepherd (Aussie), 2 years. I left them in the room to answer the door for my paper boy, only to come back 5 minutes later to find 10 pillows that were chewed up by all four dogs. Amazing how they all work together."